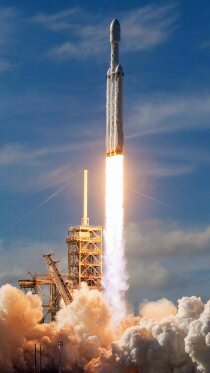 On February 6, 2018 at 20:45 UTC SpaceX performed the maiden test flight of their Falcon Heavy rocket using Elon Musk's old Tesla Roadster as a part of dummy payload. The purpose of launching a large heavy object on the maiden flight was to demonstrate that the Falcon Heavy can launch payloads as far as the orbit of Mars, although traditionally concrete or steel blocks are used for this purpose. Elon Musk once said the launch of the new Falcon Heavy vehicle was risky, and that it would carry the "silliest thing we can imagine". He tweeted on December 1, 2017 that the payload was his car. Later, he published pictures of the car taken before payload encapsulation. The car was launched with enough velocity to escape the Earth and after cruising for about 6 hours on Earth's orbit it entered an elliptical heliocentric orbit that crosses the orbit of Mars. That trajectory was not designed to intercept Mars, so the car will not fly by Mars nor enter an orbit around Mars. During the early portion of the voyage the roadster functioned as a broadcast device, sending breathtaking live video back to Earth for about four hours. There is a number of symbolic and whimsical objects aboard the Roadster. In the driver's seat there is "Starman", a full-scale human mannequin (named after the David Bowie song "Starman") in SpaceX's pressure spacesuit.The car's sound system was said to be looping the Bowie songs "Space Oddity" and "Life on Mars? "; it was intended as a symbolic gesture as no one can hear it playing in space. There is a copy of Douglas Adams' 1979 novel The Hitchhiker's Guide to the Galaxy in the glovebox, along with a towel and a sign on the dashboard that reads "Don't Panic! "; and a copy of Isaac Asimov's Foundation series on a laser optical quartz storage device created by the Arch Mission Foundation. The payload includes a Hot Wheels miniature Roadster with a miniature Starman, a plaque bearing the names of the employees who worked on the project and a message on the vehicle's circuit board stating that it was "Made on Earth by humans". Where is Roadster now ? This website tracks Tesla Roadster's past and current position in space, so you can see where it was, where it is now and where it is heading. Currently, it is located 3770941 km (2343153 miles) from Earth, going away from it at speed of 3.18 km/s (274691 km/h, 170685 mph) and it is 218150052 km (135552116 miles) from Mars, going towards it at speed of 19.09 km/s (1649413 km/h, 1024897 mph). Just go to LIVE ORBIT view and see for yourself. NOTE: Current orbital characteristics are based on NASA/JPL HORIZONSsolution #10 from March 27, 2018. Over time, trajectory prediction errors could increase more rapidly than the formal statistics indicate due to unmodeled solar pressure, thermal re-radiation, or outgassing accelerations that are not currently characterized but may exist. 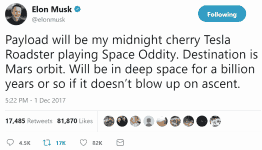 At the moment, Musk's Roadster is on a heliocentric orbit heading towards Mars. 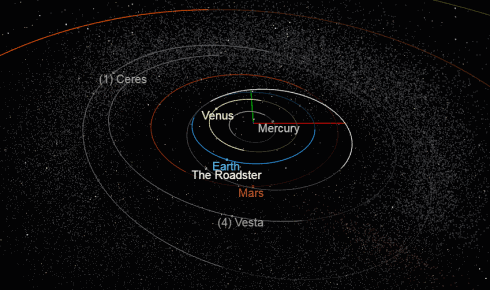 It crossed Mars' orbit in July 2018 and continues towards the inner edge of the Main Asterods Belt. In November 2018 it will reach the farthest point of its orbit and turn back towards Earth's orbit, however it is not going to pass near Earth or Mars for the next few years. Check out real-time simulation of the Roadster's position for more information. Not affiliated with SpaceX, Tesla Inc, Elon Musk or NASA. Also, trademarks belong to their owners.